Final Jeopardy: Where in Boston can you both drink Harpoon Rasberry UFO on tap in the outdoors AND wait in the world’s longest line for the world’s dirtiest bathroom? 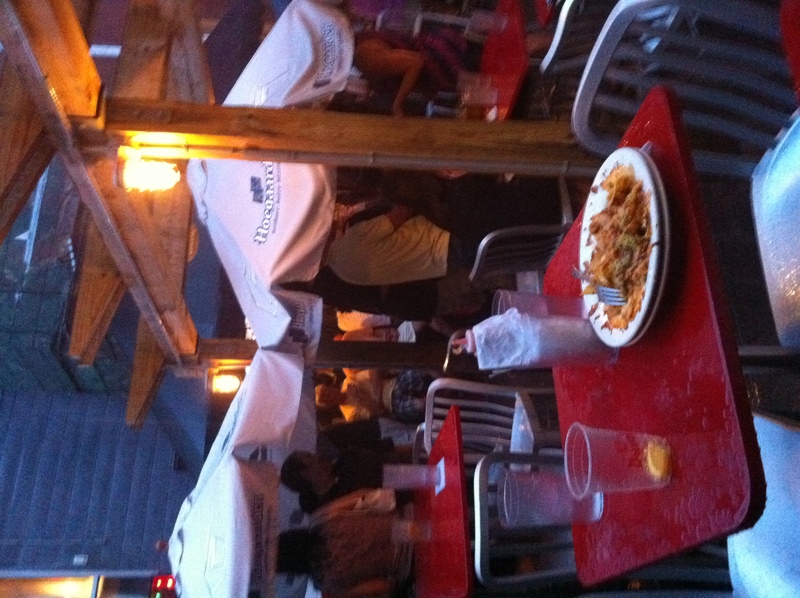 Why, at Charlie’s Beer Garden in Harvard Square, of course! Run by the fine folks behind Charlie’s Kitchen right next door, the beer garden is a godsend during the summer, when alfresco drinking opportunities are few and far between. 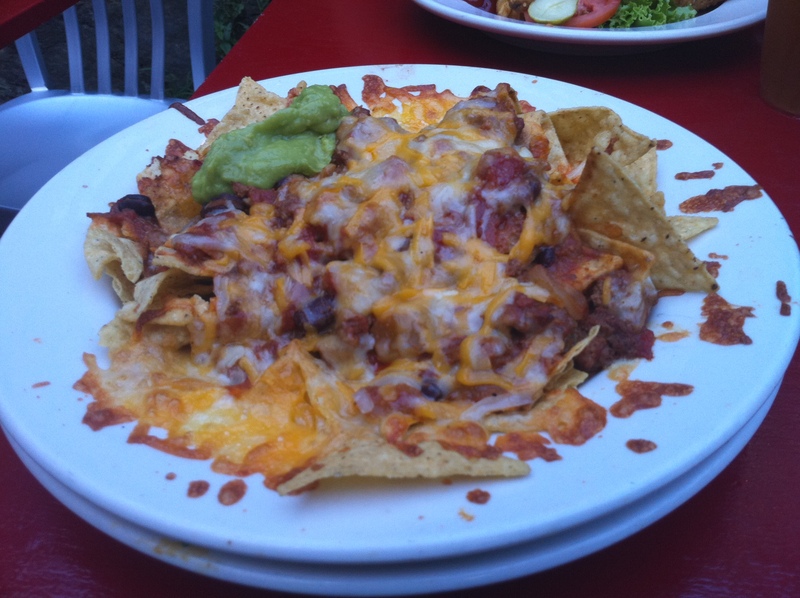 We love the burgers here, and were very excited when nachos made a debut on their summer menu. Do they earn their place in the permanent rotation? Let’s find out! Appearance: (6) Flat, but that isn’t necessarily a bad thing. Decidedly cheesy to the naked eye, which is decidedly a good thing. Quality of Ingredients: (5) Decent chips, though definitely not homemade. The guacamole was gluey enough to be decidedly from a bag, but still appreciated. The cheese was quite melty and delicious. And then….we come to the chili. At first bite it seemed innocently tasty. Kidney beans and meatball-sized chunks of ground beef were pleasant surprised. But then, we realized that something with the chili was terribly, terribly wrong. It didn’t seem at all more watery than usual, but for some bizarre reason any chip that touched it became immediately soaked. And not soaked in a good way, with a thick, flavorful gravy– more like sodden. Price: (2) We can’t remember how much they cost and they aren’t listed on the online menu. Whatever it was, they weren’t worth it. Overall:17/40. 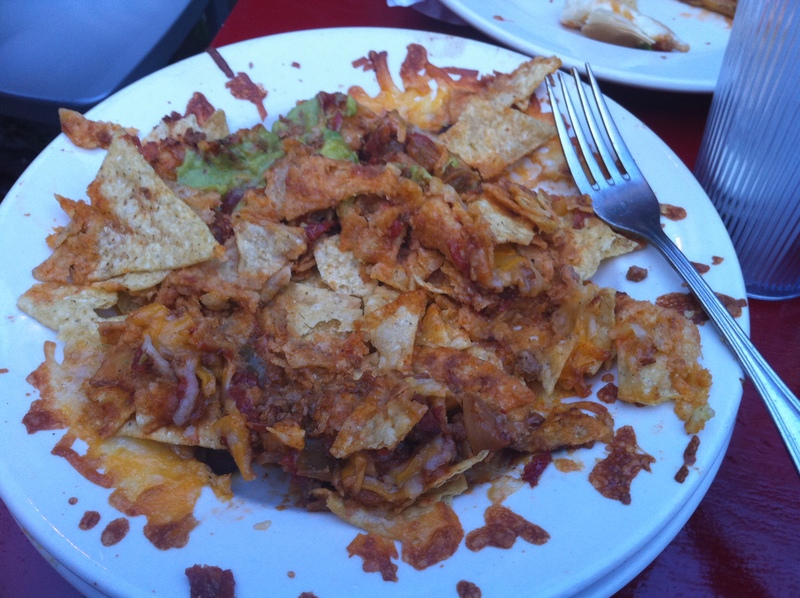 Looks like the Otherside Cafe has some competition for the worst nachos served to you in the company of fixed-gear bike riding hipsters. It was fitting, nay, even poetic that after these soggy nachos, God saw fit to open up the skies for a surprise downpour and soak them even more.